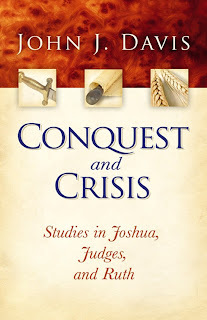 Copies of the newly expanded and revised Conquest and Crisis: Studies in Joshua, Judges, and Ruth by former Grace College and Seminary president John J. Davis are now in the BMH Books warehouse and available for shipping. The book is a concise analysis of Israel’s conquest and settlement of Canaan. In the 274-page paperback the author uses recent archaeological discoveries, the Hebrew text, a thorough understanding of the Near Eastern culture, and a number of new charts, graphs, maps and archaeological finds to interpret the history and theology of the three Old Testament books. Retail price on the book is $17.99 and the ISBN number is 978-0-88469-258-4. It is available online from www.bmhbooks.com, by calling (toll-free) 1-800-348-2756, or from other online and bricks-and-mortar Christian retail outlets.